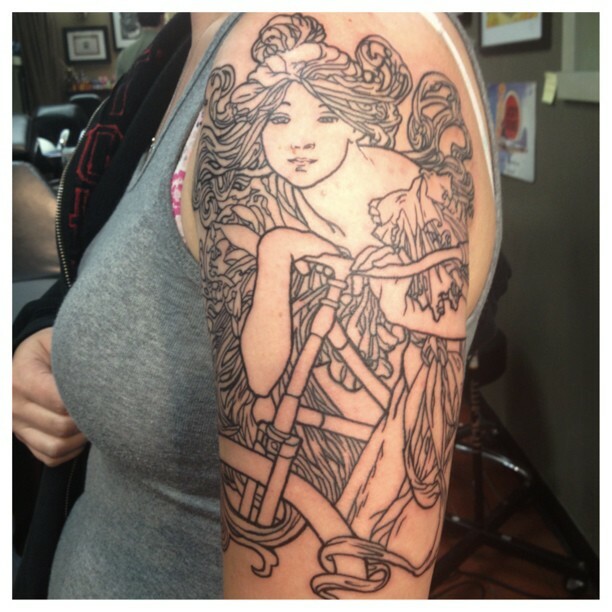 hill climbing – wife. mother. awesome girl. 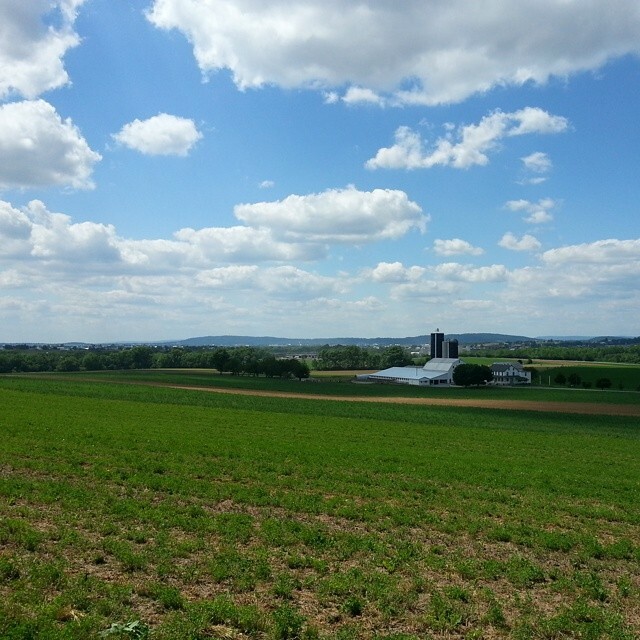 This past Thursday morning my husband dropped me and my friend Ken off at a parking lot out in Phoenixville, PA under gray skies and a chance of more rain to come for a four-day bike ride to Gettysburg and then back to Philadelphia. We pumped our tires, loaded our bags into the truck, and set off on a new adventure with 28 other soon to be friends. 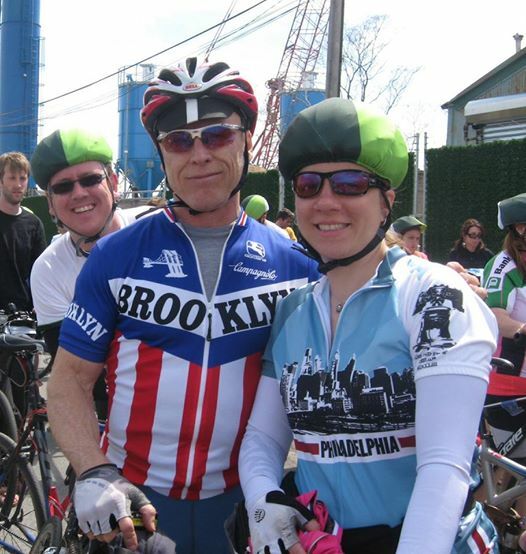 The Ride for Homes is an annual four-day cycling event coordinated by Habitat for Humanity Philadelphia to raise much needed funds to support their work in the Philadelphia region. This year they are using the funds raised for this ride to make basic repairs to six Habitat homes. 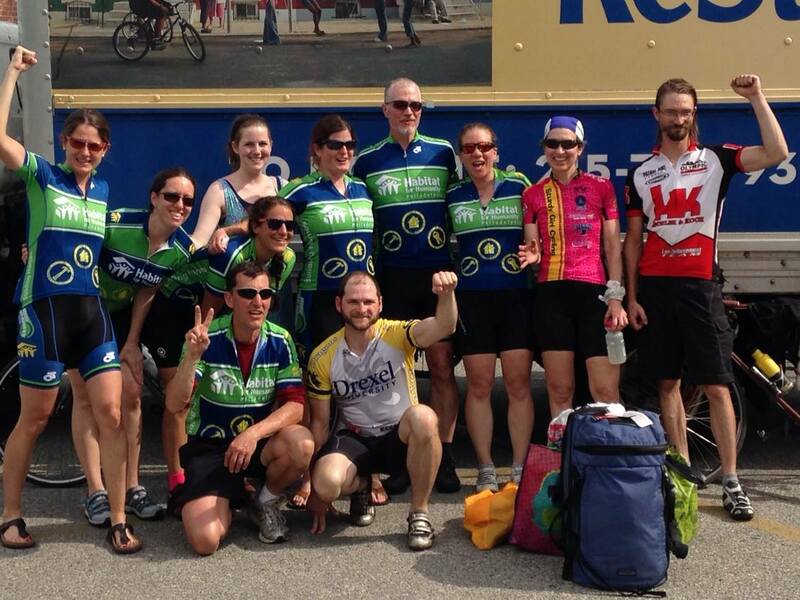 Our group of 30 riders raised over $35,000 for this worthy cause. I’ve never done a multi-day ride and was both nervous and excited about the prospect. The rain was tapering off as we set out on the road. We started as a rather large (17) group. The roads were lower-trafficked and some motorists weren’t as considerate when passing. At one point a woman almost caused a head-on collision as we rolled up a steep hill on a two-lane road and she tried to pass with an on-coming car directly in front of her. We let her pass before moving on at the top of the hill – no need to become road kill! Lunch was at a tiny Joanna General Store in the middle of nowhere who made us fresh sandwiches to order. Delightful! At this point I decided riding with my cycling waist-pack was going to be too cumbersome so I pulled out everything I needed and left it in the SAG van. It was at this point I realized I had left my RoadID at home – but had my driver’s license and insurance card on me at all times. We decided at this time to split up the group into two more manageable chunks with about 8 or 9 riders each. Overall there were three groups – A (averaging 14+mph), B (averaging 12.5+mph), and C (averaging 11+ mph). Our group had a guy riding a single-speed mountain bike (Buckman!) who beat all of us on geared road bikes up the hills, no matter how steep or how long. We dubbed ourselves Buckman’s Brigade. 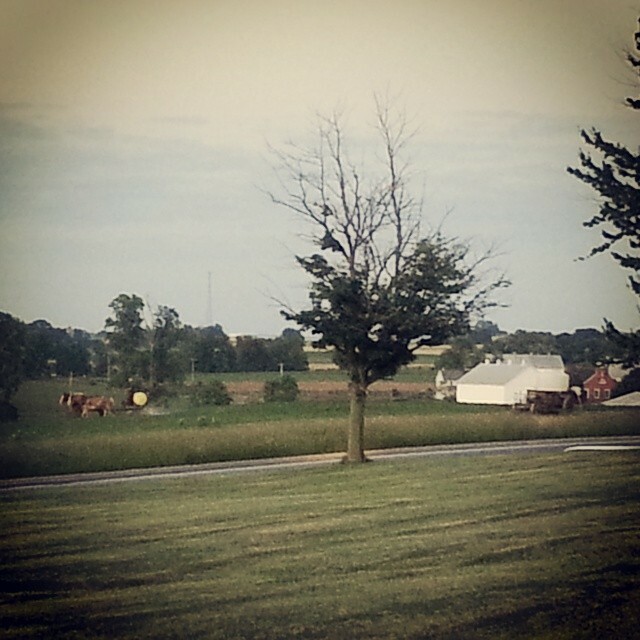 The roads got quieter after lunch as we rolled into hilly central Pennsylvania and Amish Country. The shaded roads gave way to wide open roads overlooking immense valleys of farmland. So many hills! 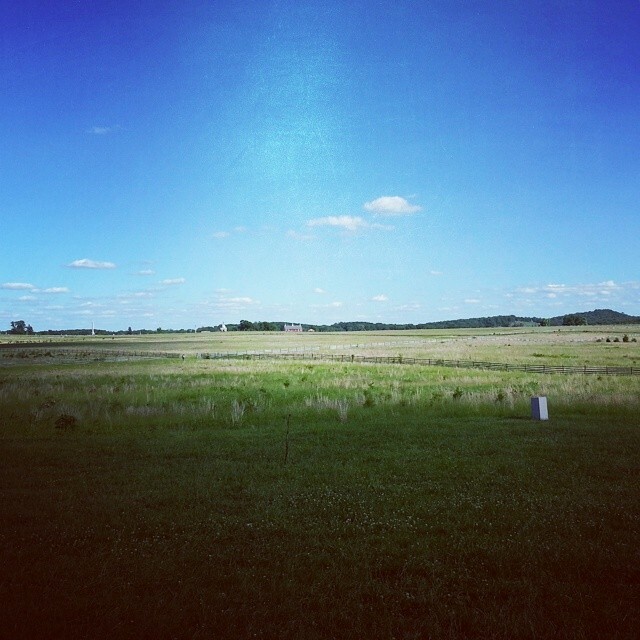 Every other farm was selling strawberries or promising sweet corn in a few weeks. We checked in at a Holiday Inn Express in Lititz, PA, got cleaned up, and then walked over to a local church who fed us delicious vegetarian lasagna, salad, fruit, and rolls. We heard from the local Habitat about the work they do in Lancaster County and then departed for a quiet evening back at the hotel. Day Two was the shortest mileage day – or the longest depending on what options you chose. The base miles got you from Lititz to Hanover. 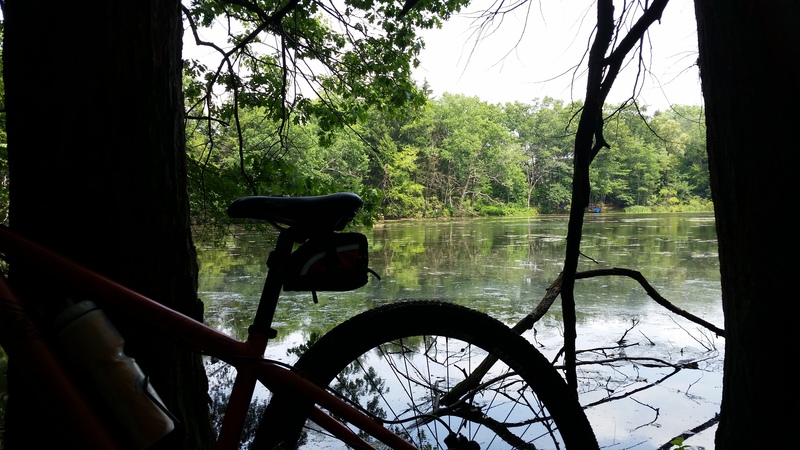 The weather was sunny but mild, perfect early summer riding and not a hint of humidity. 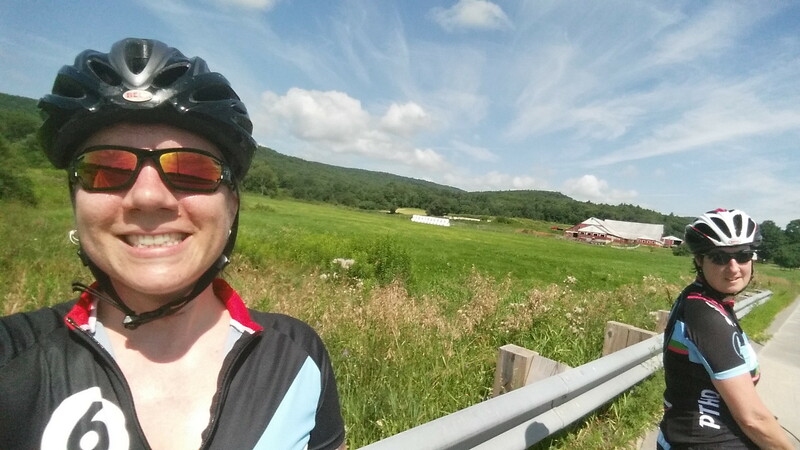 The ride was mostly uneventful – noodling along country roads until we had to cross the mighty Susquehanna River. There are only a few places to cross the river as it is – and we got to cross on the Lincoln Highway. The bridge is beautiful and the river is wide. Once across we rolled down to York for lunch. Once we were in the town limits, the C group caught up to us so we ended up taking the lane. It’s always fun to lead a block of cyclists through city streets, two and three abreast. Unfortunately the Turkey Hill branded gas station did not have a sandwich counter and very slim pickings for lunch options. Made do with a couple subpar cheese sticks, a bag of chips, and a coke. We separated from the C group after lunch. Continuing on back into the country and the endless rolling hills. Thankfully we were able to keep momentum on some of the hills; others were a total bear. Rolled into the Holiday Inn Express in Hanover with time to check in and get more snacks before departing on the optional Gettysburg loop. A small group of mostly B riders with a few A riders headed out along PA 116 to see Gettysburg National Military Park. The group quickly split into two factions. I stayed with the slower group. We were tired but pedaling felt better. Gathered at the Visitor Center before heading out on a short loop of the battlefields. We stopped to talk about the Civil War and the significance of us visiting on the anniversary of D-Day and war in general. Having missed a decent lunch and not having had dinner yet, we opted to SAG it back to Hanover where copious pizza and salad awaited us. Day Three began at 70* when we rolled out at 9am. We knew this was the longest day in the saddle as well as the hottest. The word of the day was Hydration and unfortunately I failed at it spectacularly despite drinking through my water bottles. Which was very disappointing but we’ll get to that. I only made it 46 miles (and 2,710′ gain). I wish I remembered more about the ride. The morning was fine if hot. As we rolled up to the first water stop, I hopped off my bike and instantly felt nauseated. I shoveled a banana, ClifBar, and trail mix into my mouth while refilling my water bottles with Propel-laced water. I’ve been using Propel for a couple years now, since Gatorade never sat well with my stomach, with no problems. I’ve now learned the rules force your hand a bit on multi-day rides – you find your weak points very quickly. If your bike isn’t dialed in, your saddle hurts you, or your shorts aren’t up for the challenge … you will find out. Yes, that was me on Day Two wearing my old worn-down shorts thinking it was a low-mileage day and it wouldn’t be a big issue. It was. I’m sorry, booty. We rolled out onto a shaded rail trail and I couldn’t shake the nausea. When we stopped for bathrooms, I shoveled more trail mix into my face thinking it was a nutrition issue since the day before we’d had a ridiculously light lunch and I’d tacked on extra miles. I sought out shade at every opportunity. Onward. Lunch at a Subway in Red Lion was a welcome opportunity to cool off in the air conditioned restaurant and put real food in me. People started asking if I felt ok. At the time I didn’t understand why and said “yes” even though I felt hot and lightly nauseous. I even dumped water all over me after eating in an effort to cool off. It worked for a bit until we hit open roads with no shade and long, long climbs. We screamed down a monster hill (so exhilarating!) before rolling alongside the river to get back to the Lincoln Highway bridge back across the Susquehanna. I should have been able to enjoy the river road but instead I felt horrible. It was a slog, a death march. Every pedal stroke felt like too much energy. Just get to the next water stop. Just get to the water stop. We get to the water stop and I immediately start eating again, not thinking this was a hydration issue. Several people asked if I was ok. I finally relented and accepted a spot in the air conditioned SAG van … and noticed it didn’t feel that cooling. I decided to throw in the towel and SAG to the next hotel. I shoveled trail mix and a banana in my mouth. One of the SAG women gave me a cold washcloth for my neck, iced down my coke and told me to sip it. I obeyed. My group rolled out for the final 23 miles and I sat there thinking what an embarrassment this was. How could everyone be feeling so good and I feel so bad? What was I doing wrong? I knew I couldn’t ride another mile so I didn’t regret the choice to SAG back to the hotel but there was a sense of loss in riding in the SAG van. I’m not comfortable with my own vulnerability. Checked in at the Historic Strasburg hotel, got a lukewarm shower and sat with a cold washcloth on my neck in my air conditioned room. Everyone asked how I was feeling. Much better – but I didn’t want the attention. I just wanted to be treated like everyone else. But I was also thankful for the SAG team, the leadership on the ride, and also for knowing myself well enough to call it quits before causing a much bigger problem on the road. While eating dinner at the local church that was hosting us, I was texting with my husband. Toying with the idea of going home. The coke helped but I was back on Propel water and starting to not feel as good again. My friend Coco gave me a Nuun tablet and I added it to my water. Very quickly I started to feel significantly better. I told my husband I was going to try to ride the final day and not to come pick me up. Coco gave me another tablet to drink before bed, which I did. I say all this because I did my research and turns out Propel does not have any sodium in it. None. So I had basically ridden three long days in the sun and heat with nothing more than flavored water. NO WONDER I FELT LIKE JUNK. This is the Truth of the Bike Tour. I borrowed a tube of Nuun from Ken for the final day and made the plan to just get to each water or lunch stop and decide what to do. Baby steps. I won’t lie – I was very nervous about riding. The forecast was for hot and similar hills/mileage. But I knew I had to push on as long as I felt good because I can’t let one bad experience influence my cycling journey. Learn from mistakes. Very nervous starting out on open roads but we opted to leave a half-hour earlier to try to beat the heat. Pre-gamed with juice, extra salt on my eggs, and 12oz of Nuun water before we even rolled out. Just get to the water stop. But not so nervous as to not snap a quick selfie with a guy on the ride who also graduated from my Colorado high school. What are the odds?? This guy graduated from my high school! Lambkin Pride! The day ended up being so much better than I expected. My new-found attention to hydration paid off. I sipped water every two miles, swigged at every red light or regroup at the top of a big hill. We also eventually rolled onto brilliantly shaded roads by creeks and streams that were very refreshing. Our group had gelled over the past few days into a team of 10, which honestly made the miles disappear. We had a few good hills but mostly gentle rolling terrain and overall the day was delightful. Our first water stop was at the Coatsville Habitat build site. It was incredible to see Habitat’s work in action. The homes were adorable and had unsurpassed views of the valley. I felt so honored to be supporting such an amazing organization with the help of my friends and family who donated to my campaign. Lunch was in Chadd’s Ford at Wawa. Seriously – the best convenience store ever. When we paused in Ridley Creek State Park, I noticed I felt nauseated again and realized I hadn’t been drinking as much when we went through the park due to the high volume of pedestrians and kids on the roughly-paved multi-use path. I started sipping again and got it under control in time for the water stop. +1 for Laura for knowing how to solve the problem now. The final 13 miles went by so fast. Before we knew it, we were taking the lane and rolling through Manayunk towards the finish point. Overall this was an amazing experience. The support staff was incredible. The route was incredibly beautiful and as low-trafficked as possible. The people I rode with felt like old friends by the end. I nearly cried hugging everyone goodbye before going home. I love you guys, Buckman’s Brigade! A huge shout out to my friends: Coco for pep-talking me into signing up; Maux for her unwavering support during my most dire moments; Ken for always riding with me – and the bottle of Nuun; Chris for sharing his touring wisdom and conversation; Kristen for talking Girl Scouts with me; Laura S for her knowledge of political controversy (and being the other half of Double The Awesome); Sarah for her laid-back vibe and whimsical streamers on her helmet; Buckman for leading the charge every time; Kyler for being our most excellent mechanic. 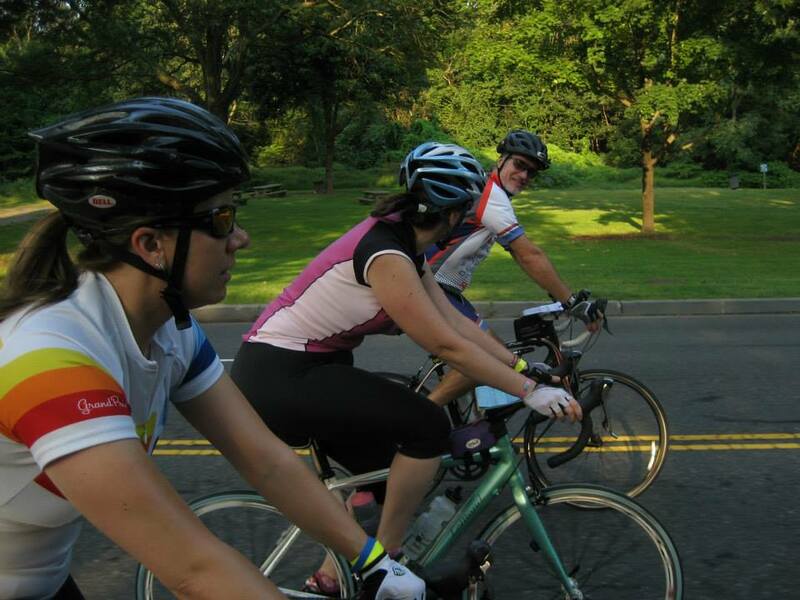 If you have a chance to sign up for the Ride for Homes Philadelphia, I highly recommend it. I want to tell you I had an amazing weekend and this event was SO MUCH FUN. I really do. For many people, I’m sure today was awesome. For me, today was very disappointing. 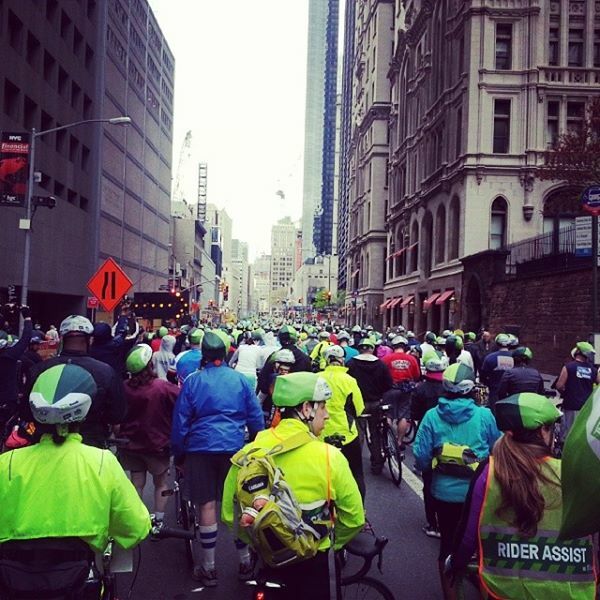 The TD Five Boro Bike Tour is a 40 mile car-free bicycling event put on by Bike New York. 32,000 bicyclists. $90 entry fee. Packet pick-up must be in person at the Expo. A great way to see The Big Apple! My friends and I managed to get signed up and planned a whole weekend around this. Saturday we drove up to Staten Island to check in to our hotels. 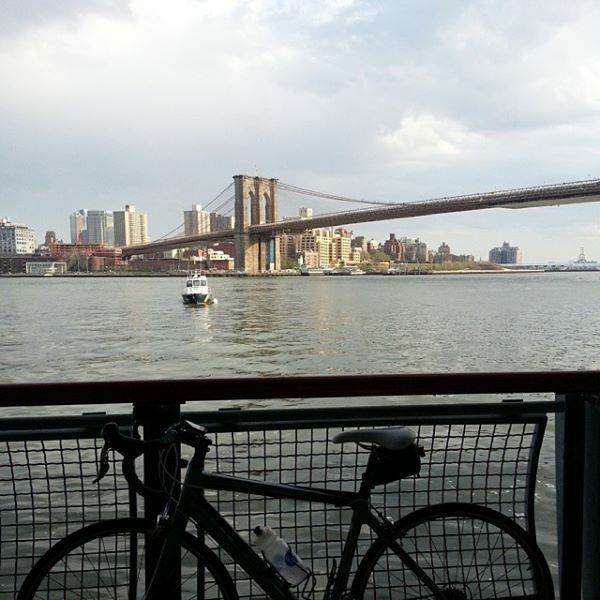 We then biked over to the ferry to Manhattan. If there is anyone that can make Philly drivers look like fine, upstanding ladies and gentlemen – it’s Staten Island drivers. Of course, we were on a more direct route … but when we crested the second hill, the sun setting behind us and casting a golden glow on the City before us … the view was spectacular and made the ride over worth it. Biking to the Expo in Manhattan was a joy because of the absolutely lovely cycle track along the river with amazing views of Brooklyn. On the way back it started to rain. Agreeing there’s no one to pick our butts up, we saddled up and rode back to the hotel. Did I mention we were in street clothes? Cotton is rotten in the rain. Acquired a hot shower and clean clothes before we got some dinner. We all agreed the tour would be super fun – lots of people and no speed records but a nice conversational ride with friends. This morning we were assigned to the last wave of riders for the tour. We had initially rejoiced in this stroke of good fortune to be able to sleep in – until we missed the last ferry to make the official start time. No matter, there were lots of others still waiting for the ferry. We got to the start line about 20 min late, which we figured we could make up without issue. Until we hit the first wall of people. They aren’t kidding when they say 32,000 people sign up for this. this was our view all day. * rolling through the streets of Manhattan and Harlem. The Bronx and Queens were a bit rougher on the edges and Brooklyn lived up to its reputation as a hipster mecca. * riding down the Brooklyn-Queens Expressway. Seriously – have you ever ridden your bike on a major highway? * Local musicians along the route keeping the vibe pleasant. * fresh NY bagels at the rest stop we visited. 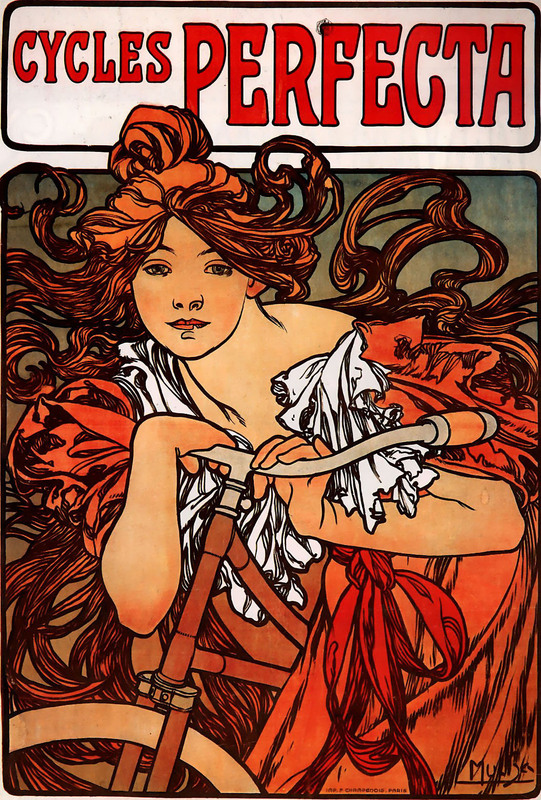 * Riding bikes! With Friends! in New York! * Being Assigned the Third Wave. Dominated by cruiser bikes and folks who generally do not know how to ride in a group, much less a very large group. I don’t recall asking for the third wave or being told waves are assigned by expected average speed … or really anything. You’re just assigned a group. * Walking. Entirely too much walking happened because of the rider volume, medicals (more people went down than I’ve ever seen in an organized event), and any sort of incline in the road. At one point we were stopped for somewhere around 30-45min just to get over a bridge. Due to volume. * Being forced to take the mandatory shortcut because we failed to meet the cutoff time. Lopped 10 miles off our ride. See above for why. So sad because my friend was volunteering at the aid station on the cut miles. * Other Rider Fatigue. My brain was fried from having to be hyper-vigilant in avoiding other riders that stop in the middle of the road, stop suddenly/without warning, walk their bikes across the road without checking to make sure no one is riding on the road, weaving, taking selfies while riding, etc. I really feel like a heel for saying I’m disappointed in the event because I was riding with slower riders. There’s nothing wrong with being a weekend fitness cyclist or a cruiser cyclist or someone who only rides sometimes. Honest – I really feel this way. But the truth is, had we been seeded with other cyclists at our similar abilities (but not the hammerheads) the day would have been completely different. 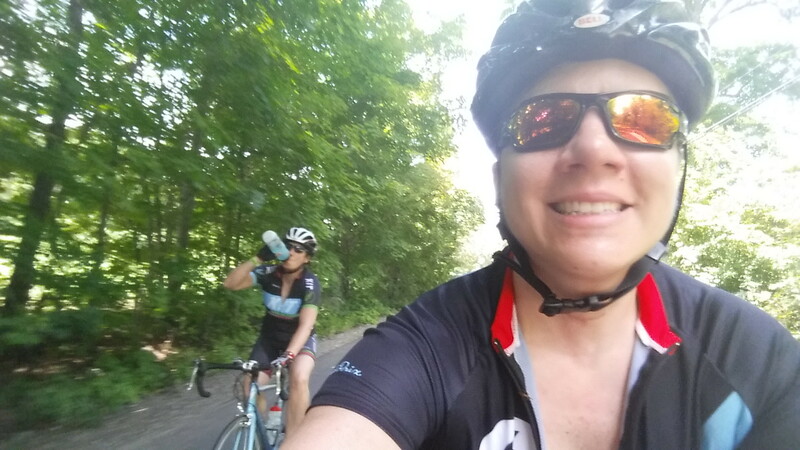 Instead of trying to find clear passing lanes and walking entirely too much for a bike ride (i.e., at all), we would have had what we had looked forward to – a conversational speed bike ride. It became a running joke to us that anytime we had to stop and walk was because there was a hill. Which is so sad but true – we walked so many hills towards the end because there was no room to ride. Everyone was walking because a few people weren’t able to cycle up the hill. Eric, Phil and I during one of the “why are we stopped?” moments. Based on my experience today, I can’t recommend this ride to anyone just yet. One of my friends did the ride last year and was in the first wave. She said the experience was so much better last year – she had no issues with walking or being stopped or having her ride cut short. So I’d be willing to give it another try but only if I knew I would be in the first or second wave of riders. I went for a ride with my friend Ken and our new friend Rachel from Missouri last weekend. It wasn’t particularly long and while we stopped for a healthy snack, we probably could have done with out the stop. It was ridiculously fun though and I admired Rachel’s awesome Yakkay helmet and her super-cute haircut. Rachel was going to the National Bike Summit the next day. She reported back that my awesome friend Katie, who was presenting on her Women Bike PHL movement, mentioned me by name as part of the Girl Scouts on Wheels program. So humbled to be mentioned at a national summit about cycling. 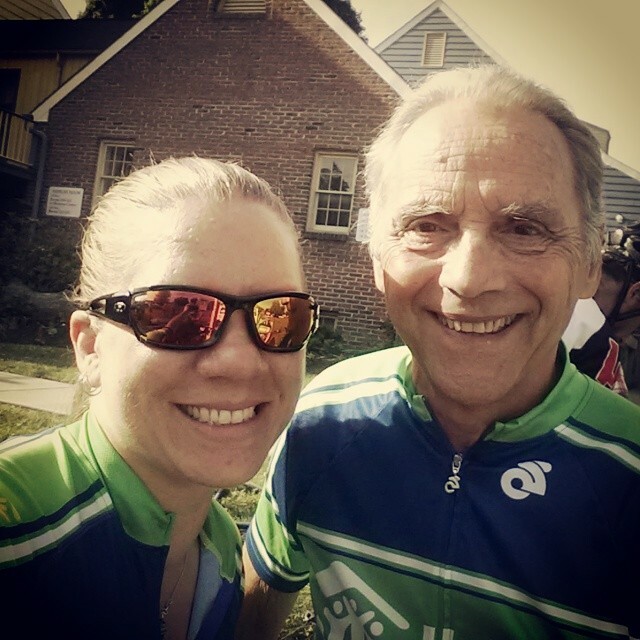 Katie rode her bike from NYC to DC to attend the summit. She’s amazing. Then one of my favorite cycling apparel companies, Road Holland, put a photo I sent them in their Year End blog post. 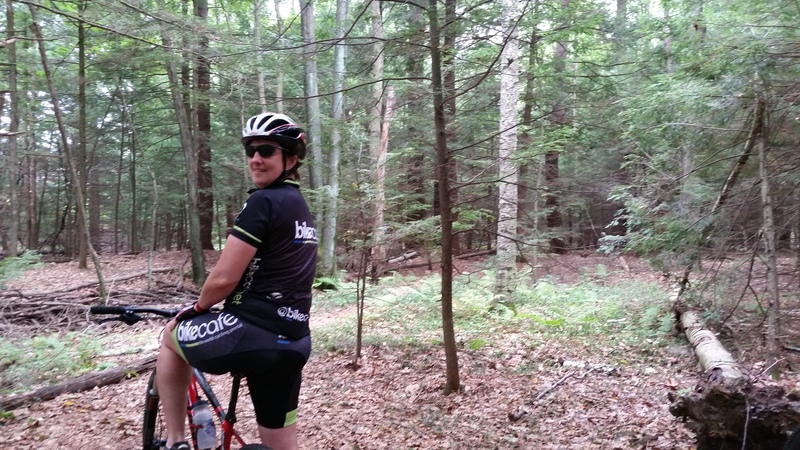 They make great wool-blend cycling jerseys and I love them for spring and fall rides. 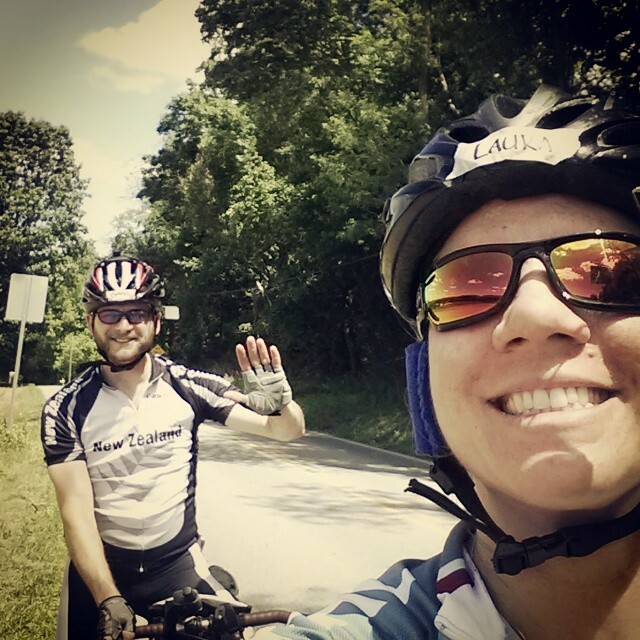 Today my friends at 30 Days of Biking featured me on their Facebook page. I don’t even know why but I am tremendously thrilled to be chosen for a random shout-out. And hey – if you haven’t taken the pledge yet, why not now? Pledge to ride your bike every day in April – any distance, any speed, any weather, every day. Share those experiences online in a joyful cyclist community! Today I was out for a 30-miler with Ken that featured snow-clogged trails, a wonderful sit-down snack at Outbound Station, and then me suggesting we tackle some hills on the way home. Because you know, not riding regularly is really conducive to attacking big hills. We biked up this monster on Hagys Mill Road in Philadelphia – it’s a little over a quarter-mile and averages 12%. There is one pitch in particular where I was genuinely concerned I might fall off my bike and why the hell would I ever want to be clipped into my bike? I think that section is around 17-20%. Anyway, it was all hills and busy roads home from there. Beautiful day to ride. We haven’t had many of these lately this winter so you have to grab the days you can.